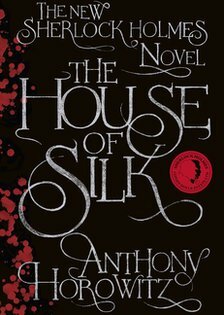 ‘The House of Silk’ by Anthony Horowitz is the first Sherlock Holmes book to be approved by the estate of Arthur Conon Doyle. You may know the author as the BAFTA-award winner creator of Foyle’s War and Midsummer Murders, or as the adapter of many Agatha Christie’s Poirot novels for television. He has written over fifty novels, possibly most well-known for the very popular Alex Rider series. I was cautious mainly because approval isn’t everything. The Guy Ritchie movie starring Robert Downey Jr and Jude Law is enjoyable, yet it felt the need to change canon to suddenly introduce Adler as a love interest, which changes Sherlock Holmes as a character entirely. Despite my caution and, to be honest, nitpicking throughout the book, I discovered that Anthony Horowitz is worthy of the estate’s approval. I was ready with a notebook and pen to mark down any changes to canon or, dare I say ‘mistakes’, and yet all I noted was that Lestrade has finally been given a first name (George) and really, that’s it. The novel is written like most of the original novels (but not all) from Watson’s point of view. It is being written after the existing novels as Watson is reminiscing on their adventures together. At this point in time, Sherlock Holmes has passed away and Watson, of course, misses him. And so he picks up his pen once more to write of one of the adventures together, and begins to tell us the tale of The House of Silk. It starts enjoyably, with Holmes acting exactly as we love him, by deducing the wildest facts from only the barest of clues. He tells Watson that his wife must be away, that a child is ill, and that he missed a train. And all from the knowledge that Watson is apart from his wife on their anniversary, how Watson looked at a newspaper and how carelessly Watson has polished his shoes! The story moves on, quickly submerging into a complex plot that is reminiscent of Doyle, where there are so many leads that you think are almost solved, yet then it delves into yet another twist of the tale, becoming darker and convoluted. Somehow, Horowitz manages to make the plot detailed and complex, yet it remains understandable and most importantly, he ties up all the loose ends by the last page. I was pleasantly surprised by the characterisation in the novel, which I found to be as close to perfect as could be possible. The way Holmes and Watson interact is the closest of friends, who only have thought for each other’s best interests and completely, understanding the thoughts of the other, simply from how they hesitate or frown. The writing is solid, the descriptions visually conjuring and the tone is dark and brilliant. I could not find a single thing to fault in this book. The only thing I’m left wondering is whether or not Horowitz will be writing another. I really hope so. This review was originally posted at SentientOnline on the 23rd November 2011.